From the African American inventor of the famous Sta-Sof-Fro hair care products. 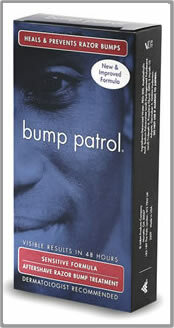 Bump Patrol After Shave Intensive Treatment is tough on razor bumps and razor burn. Not on skin. Only Bump Patrol Razor Bump Intensive Treatment (Sensitive Formula) can be used with depilatories (Shaving Powders or Creams) and for those who are allergic to aspirin. This product can be used on bald heads and faces; anywhere you shave. Save your face - buy it! !